Me and my friend Mike spent part of the weekend crawling around under my Mom’s new (old) house with a sawzall (otherwise known as “destructor of worlds”). This house is not as old as the Old Vic, but dates back at least 80 years I think. It is just down the street from the Old Vic. 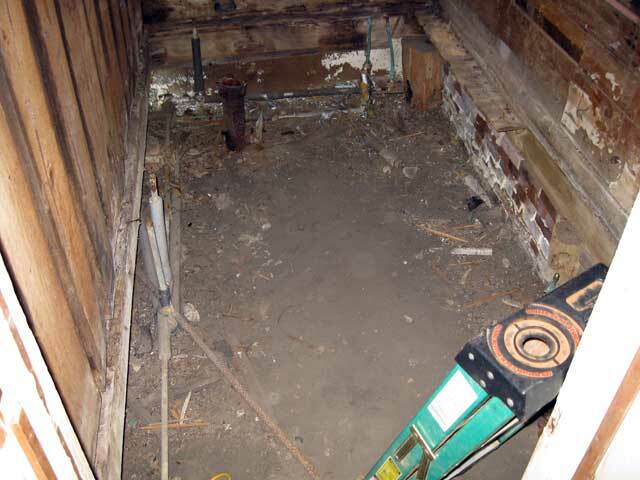 We pulled out the bathroom floor and cut out the rotted joists and plumbing. We then installed new joists/framing in proper locations for the long term health of that part of the house. This bathroom was added on what used to be a porch WAYYY back in the past, and the structure there needed a bit of upgrading. The bathroom floor. Basically, we struck dirt! Next, we got out the house jacks and jacked up a particularly troublesome low spot. All went well. More to do, but it got too hot to continue (104F). When, due to the heat, MTBB (Mean Time Between Breaks) approaches zero, it’s time to quit. Next, a bit more minor leveling (much easier to access with the entire floor out of the bathroom). Then we’ll install new plumbing, new floor, etc. Hard work, but we’ll get it done. Tired and sore (and overheated). This entry was posted in Carpentry/Structure, Mom's House, Plumbing. Bookmark the permalink.